The Godfather Of Them All. It has been over three decades since its birth, yet THE GODFATHER reigns as the yardstick by which all other gangster movies are brutally scrutinized. From the magnificent acting, to the studied direction, to the 1940s era backdrop, to the sweep of the epic storytelling (which takes us from the sprawling dark corridors of New York to the verdant hills of Corleone, Italy itself), everything about THE GODFATHER is a lesson in immortal film-making. Only twice has its primacy been challenged – with Scorcese’s gutshock GOODFELLAS in 1990 and David Chase’s superlative THE SOPRANOS in 1999. Everything else runs a far, far fourth behind these juggernauts. From Mario Puzo‘s book of the same name, Francis Ford Coppolla directs the legendary story of an East Coast crime lord, Don Vito Corleone (Marlon Brando in the eponymous role, which would win him a Best Actor Oscar that he would not turn up to accept on principle), grooming his eldest son, Santino “Sonny” (James Caan) to take over the Family Business, that being, one arm of the Italian “Five Families” who run the Eastern seaboard’s organized crime. When Sonny is brutally gunned down in an inter-familial dispute, Corleone’s youngest son, Michael (Al Pacino), who sought a life removed from the Family Business, ultimately discovers his familial and business instincts and steps into the breach to take the reins. Like the movie itself, its characters have weathered the three decades to become icons by which all other movie gangsters are measured; most of the actors in these staggering roles never quite shaking off the specter of their characters – which will surely haunt them far past their own deaths. These archetypes have become so ingrained in our culture that it is almost impossible to think back to a time when they did not exist; like trying to imagine a world before Smoke On The Water or STAR WARS. Very simply, if not for THE GODFATHER these archetypes would not be archetypes. 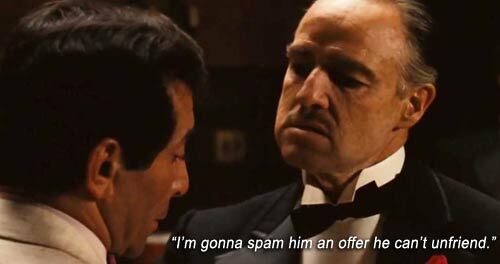 The movie actually influenced real crime families with its new street vernacular (“Make him an offer he can’t refuse”) and manner of conducting “business” (regarding any means to achieve an end as honorable – as long as the good of The Family was invoked). The greatest gift THE GODFATHER bequeathed the movie-going public was its unapologetic stance on anti-social behavior. Beyond “Man with No Name” protocol – where a lone stranger would operate by his own rules, disregarding anyone else’s well-being for his own ends – here was a Family, an organized para-militia of sociopaths who followed principles wildly at odds with “normal” society’s. Yet Puzo, Coppolla and actors boldly offer no excuses as to their characters’ existence, motives or actions. After our Gangster 101 schooling with James Cagney, Edward G. Robinson and George Raft, here was a blood-driven, wealth-engined world only hinted at in those previous gangster genre movies, now fleshed out almost against our will; here was a world where our societal notions of right and wrong were utterly reversed, yet which made sense in the verisimilitude of its own universe. And indeed, these characters are not mindless convenience store hijack artists – they are businessmen in the truest sense of the word. They are also imbued with a strong sense of loyalty and justice. One might be inclined to believe their form of direct justice differs from a society’s which would let a wrongdoer walk free on the proviso that he has enough capital to keep him out of jail, but they are exactly like the society that would do this; when a wrongdoer can yet benefit you, you squeeze him for those benefits – when his usefulness ends, do away with him. Is this not exactly how supposedly civilized society works? Through movies of this ilk, we are made aware of the extortion that small business owners must endure in neighborhoods ruled by crime families, but aren’t all those “legal” crippling taxes and business licenses and stamp duties and land rates exactly the same thing – refuse to pay and the collectors will destroy you? Gangster or government, the methods are different, the end results the same. Though THE GODFATHER may seem apologist towards supposedly heartless criminals, telling the tale from their point of view allows us freedom from guilt when we realize that “crime” is a subjective term. As Don Corleone states, when opting not to murder molesters, but rather land them in hospital like their victim, “We’re not murderers.” There is a fine distinction between killing for business reasons and cold-blooded, meaningless murder. To those who still share Kay’s views about legal factions being untainted in the ways of killing, look to death penalties, look to unnecessary wars, look to destroying people so thoroughly through “legal” means that their only recourse is “crime” to support themselves, or suicide. Clearly, the underworld’s ultimate goals and methods are no different than the overworld’s. No matter they dabbled in gambling, prostitution, money-laundering and murder, they sought only to be self-sufficient, to keep their families well, and to live comfortably in peace – otherwise called The American Dream. In setting the tale in the 1940s, Puzo and Coppolla removed us from everyday reality from the outset; in this insular universe we readily accepted The Family’s version of morality. 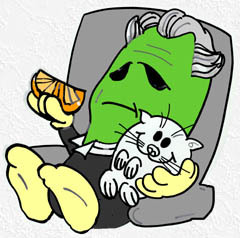 It did not help puritan philosophy to learn that the authority figures that the Corleone family dealt with (judges, cops and congressmen) were as “corrupt” as the Corleones, readily bought off, with common knowledge they were “in the Godfather’s pocket.” The authorities’ actions in the film seemed to vindicate our darkest suspicions that the people whom we place our unmitigated trust in for safety from society’s savage shadow dwellers are in cahoots with those very shadow dwellers who are trying to subvert our safety. 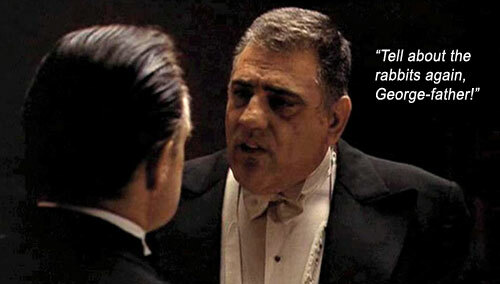 But then, we must reason, protagonists like the Godfather’s people do not readily cross our path. Their dealings with high government officials affects us less directly than plain old government or corporate crime, which insidiously places us at risk, lying to us through the blatant robbery of our monies, liberties and securities. In the movie’s opening scenes, which establish much of the character of upscale criminal philosophy, Don Corleone assures Bonasera that in allying with him “then they would fear you.” The eternal question: is it better to be feared or loved? (The same theme would be judiciously addressed in Robert De Niro’s and Chazz Palminteri’s excellent A BRONX TALE, 1993). It would seem that fear is the key. For Bonasera finds that in trying to gain love by abiding with society’s prescribed legal system, he was shown only contempt. And true justice (not simply murder, but a retribution visited upon his daughter’s assailants equal to the pain they inflicted on his daughter) could only be meted out through Corleone’s system of fear. Excepting Brando, the stellar cast were not yet movie stars in their own right, yet each delivers a performance worthy of so much more acknowledgement than the stunted Academy could ever give through their paltry statuettes. 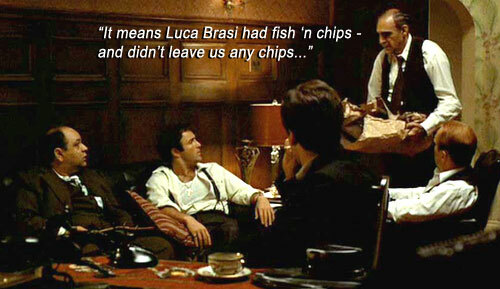 Robert Duvall as Irish-German consiglieri, Tom Hagen; John Cazale as the mildly-backward Fredo Corleone; Lenny Montana, in a few precious minutes of screentime, creating such an impact as the formidable mercenary, Luca Brasi – even though he was tricked to his death – that it almost seems Jean Reno’s role in LEON (aka THE PROFESSIONAL, 1994) was a continuation of this character; Sterling Hayden as the crooked cop, McCluskey; and a personal favorite, Richard Bright as Al Neri, Michael Corleone’s bodyguard, who hardly utters two words, yet exudes such cruel cool that I grew up wishing I could one day have as faithful a liege in my employ. Director of photography, Gordon Willis, pushed THE GODFATHER into pioneering territory with his daring use of darkness. We battle to see further into scenes where action is muted in half-shadows, sepia-toned into suspense. As Willis’ cinematography challenged our sight, so too did Nino Rota‘s music caress us with snatches of unnerving leitmotifs (we cringe at the hospital scenes, as the soundtrack echoes Michael’s desperation to hide his father from imminent assassins), and haunt us with the movie’s main theme, which has come to symbolize everything Mafia. Through it all runs the unbreakable thread of Family. The opening wedding scene ends on a poignant note of a father dancing with his daughter. Harking back to the familial theme constantly, Coppolla reaffirms our deepest vicarious desires. We are all immigrants to some extent, the bonds of our heritages displaced, fragmented, growing weaker over every generation of X-Box and internet junkies; there seems nothing that can bind the strands of our familial threads. We find affinity in the blood bonds of THE GODFATHER on some level deeper than the span of oceans and the passage of time. aka: THE GODFATHER PART I.
aka: MARIO PUZO’S THE GODFATHER. Writers: Mario Puzo, Francis Ford Coppolla. Starring: Marlon Brando, Al Pacino, James Caan, Robert Duvall, Talia Shire, Diane Keaton, John Cazale, Richard Castellano, Sterling Hayden, Abe Vigoda, Richard Bright, Alex Rocco, Gianni Russo, John Marley, Al Lettieri, Lenny Montana, Richard Conte.